Garlic bread is an easy and really tasty garlicky treat. Although garlic bread can be made with powdered garlic I prefer it made with fresh. This time I tried adding some grated parmigiano reggiano on the top. The cheese melted and turned nice and golden brown. Garlic bread goes well with pastas, soups and stews. This time I enjoyed the garlic bread with this tasty ministrone soup. Mix the butter, garlic and parsley. Spread the garlic butter over the cut side of the bread and sprinkle the cheese on top. Take a look at the Think Spice…think Garlic event at Sunita’s World. Mmmmm, garlic bread yum! I do like it, but you do have to share really, don’t you, well if you want anyone to come near you anytime soon, that is? Did you share yours? 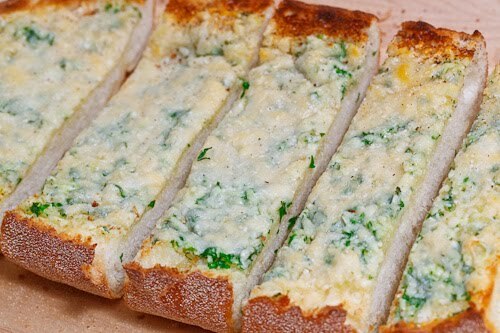 Garlic bread: such a simple, but GOOD treat. It really never fails, especially with soup like the wonderful-looking minestrone you have above! Looks great Kevin, pass the basket of bread over here! I love that simple-but-good stuff! And adding parsley is great – looks better, tastes better, and helps keep the breath down to a dull roar. Mmm… so very very good. If I know I am making garlic bread I always mix the garlic and the butter and leave them at room temperature for as long as possible while making other things – ideally a few hours. Give me bread and give me garlic, and I am a happy woman. But when you throw in a little parmesan, now that’s nirvana. Thanks for your lovely garlic bread..and yes, there’s nothing like fresh garlic. Mmm I love garlic bread – who doesn't? Never thought of making it myself, but it looks delicious!